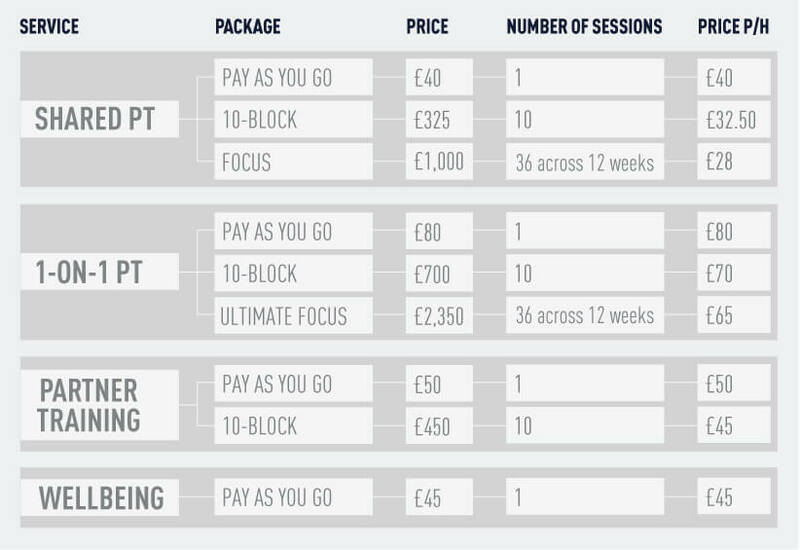 At The Fitting Rooms gym we believe your physical health is something really worth investing in, which is why we are never scared to be upfront with our prices: all our personal training prices are here for you to see in black and white! Our flexible approach to personal training means that you only ever pay for the time you spend in the gym: there are no membership fees and we never tie you down with a monthly contract. We only ever make money if you keep coming back which is why we insist on providing you with the very best possible service! PLEASE NOTE: Prices are approximate price per hour, per person. To find your best fit of training, why not register for a FREE Taster session on the button below and come in to our exclusive gym in London Bridge to see what we’re all about! I love The Fitting Rooms because it’s not like your usual gym where you are battling for a space on machines or fighting for weights along with all the other sweaty people trying to get bikini / budgie-smuggler ready for the summer. This gym is private and personal and ideal for people who are self-conscious or work out better without distractions. As a female wanting to get into shape and lifting weights for the first time, the results have been amazing! I feel stronger and can now run long distance easily, not to mention all the other good changes within my body. The Fitting Rooms really is an outstanding gym with highly dedicated, knowledgeable and motivational Personal Trainers and I really can’t recommend these guys enough, as! If you are looking for trainers who will guide and support you fully through your fitness journey, this is the place for you! I have been training with Yasmin since June 2014, during which time I have seen my strength and fitness massively increase. Yasmin has a wealth of knowledge and a real passion and love for fitness and strength training. She approaches our sessions with such consistency and attention to detail. Under her expert eye, I have been able to lift heavier week on week, which is really rewarding, whilst still maintaining a strict program and improving my form. I have learnt so much over the past year; my confidence on the gym floor is such that I don’t think twice about setting up a squat rack or knocking out a few deadlifts. In a world where the weights room is a bit of a ‘man’s world’, Yasmin is a breath of fresh air and a total gem. I highly recommend her and The Fitting Rooms gym without reservation. Highly recommending The Fitting Rooms PT gym. Convenient location, great equipment, friendly and motivating staff. Personal trainers there know their jobs very well and help you get the best out of your sessions. I was never a fan of going to the gym, but after training in TFR, gym is now an enjoyable part of my routine.